Unfortunately, due to Leah’s sudden death on August 16, 2017, we cannot provide pet tracking services at present. We still offer Lost Pet Search services and can help you decide whether or not to hire a pet tracker, but we cannot do the track itself without Leah. 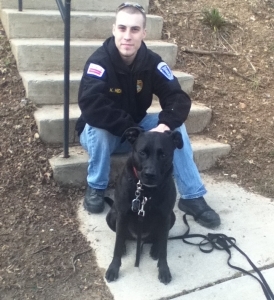 If you do need pet tracking, call Sam Connelly of Pure Gold Pet Trackers at (410) 365-7456. If your pet is missing for any reason – has run away, may have been stolen, etc. – contact us ASAP! Timing is very important and, the sooner we track, the better! We can help you find your missing family member. Pet tracking works basically the same way human tracking (search and rescue, tracking criminals, finding missing children, etc.) does. We train the dogs in general tracking. We do not need to teach them how to track – they know that naturally. We essentially just teach them what we want them to do: to find the scent that matches the one of the missing pet, then follow where the scent track leads. While lost pet tracks almost never result in finding the pet immediately (even if we track the day after the pet goes missing, it already has a 24-hour head start and the chances of our catching up are exceedingly unlikely), it is very useful in telling us where to focus the search. In other words, it tells us what direction and often how far the pet went so that you (/we) know where to put up flyers, which hopefully generate sightings of the pet, which then lead the people who see it to call you. Getting the pet back often takes several sightings, sometimes more than one track, and not infrequently the use of a humane trap, but pet tracking can set all of this in motion and eventually lead to your pet’s safe return. Leah and I have trained as a tracking-dog/handler team under Pure Gold Pet Trackers’ professional pet tracker Sam Connelly’s expert instruction for 2-3 years and continue to do so – there is always room for improvement! We are a very good tracking team. Leah absolutely loves her job and is incredibly good at it, probably better at it than I will ever be at any job I could have. Her nose is simply never wrong! I have yet even to find the limit of Leah’s potential: I know that she can follow tracks five weeks old because I have let practice tracks age that long before having her follow them; the only reason I do not know if she can track scents more than five weeks old is that I have yet to test her on one that old. 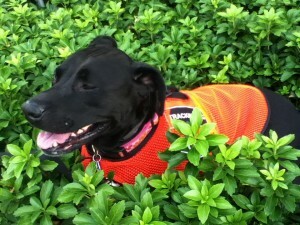 Leah has had incredible success in our tracks so far: she has helped recover many of the pets she has tracked. (See Testimonials for feedback from tracking clients.) In two cases, the pet was even home again within half an hour of her track! Furthermore, we have only had one case with a definite, unhappy ending. Still, our success rate is highly unusual and it is by no means a prediction of her success in future cases, just evidence of her ability and the value of pet tracking in general. Finally, Leah’s competence will only increase with experience. As much as we would hope to help you track your lost pet, if you want the very best tracking help available, you should hire Sam Connelly. This is particularly true in complicated cases or situations in which the pet has been missing for at least a month. 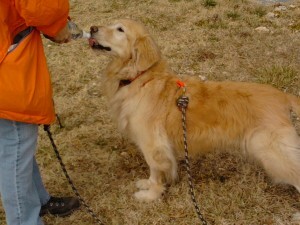 Sam’s phone number is (410) 365-7456 and her website is www.PureGoldPetTrackers.net. I have been Sam’s apprentice for years to learn the human knowledge necessary for competent tracking – lost dog and cat behavior, scent patterns, the effects of rain, wind, and other variables on scent – but Sam’s dogs are more experienced than Leah is, and Sam’s knowledge of lost dog behavior (even breed-specific) is encyclopedic. Furthermore, she can offer more extensive services, such as the rental of wildlife cameras and humane traps. Two limiting factors, however, are Sam’s rates (double what mine are) and her schedule. Because lost pet searches are essentially races to find the pet and get it home before it gets hit by a car, the tracking is very time-sensitive, so how quickly you have your pet tracked can definitely affect the outcome of your search. Sam is in great demand, so is generally very busy and may not be available to track for you right away. Salsa – tracking dog extraordinaire! If Sam is not available or if her rates are prohibitively expensive for you, Leah and I will be more than happy to help! Our schedule during business hours is generally relatively flexible so we can usually come track for you within a day or two, often even that very day. Please contact us immediately, either by email or by calling (202) 660-4694 to discuss your options. Leah resting after a track.